For the Romans life meant getting together to eat and drink, in a pub or at a banquet. Last Supper in Pompeii celebrates the Roman love affair with food and drink - a journey from fields and vineyards to markets and shops, from tables to toilets and the tomb. We see the influence of the Greeks and mysterious Etruscans, and visit fertile Vesuvius to see how Romans got their food and drink (and a Roman vineyard buried in AD79). Into the bustling city, past hawkers, shops and bars, we enter the house, visit the shrine of the gods and the gorgeous garden with its flowers and fountains. We recline in the dining room, with exotic food and fine wine, and surrounded by Greek-style luxury – fine silver, mosaics and frescoes. But in the kitchen? No refrigeration, no running water, no hygiene – and there is the toilet, feeding into a cess pit below. Escape to Roman Britain with objects from sleepy Chedworth and metropolitan London with the first brewer, the first cooper and even the first pub landlord! Finally we see the monuments of the dead feasting into the afterlife and return to Pompeii to meet a real victim of the eruption. Seize the day - Carpe diem!! Dr Paul Roberts is the Sackler Keeper of Antiquities at the Ashmolean Museum of Art and Archaeology, Oxford University. He studied at the Universities of Cambridge, Sheffield and Oxford, and lived in Italy for several years, in Milan, Rome and Naples. He has excavated in Britain, Greece, Libya, Turkey and in particular Italy, where he directs excavations in the Sabine hills near Rome and near Campobasso in Molise. His research focuses on the day-to-day lives of ordinary people in the Greek and Roman worlds; and he has written books on Roman daily life, Roman Emperors, and Roman art. From 1994 to 2014 he was Roman Curator in the Department of Greece and Rome at the British Museum, where he curated the exhibition Life and Death in Pompeii and Herculaneum (2013). At the Ashmolean he co-curated the exhibition Storms, War and Shipwrecks: Sicily and the Sea (2016) telling the history of Sicily through shipwreck finds around the island. He is now working on the exhibition Last Supper in Pompeii, telling the story of the ancient Roman love affair with food and drink (at the Ashmolean Museum July 2019 - January 2020). 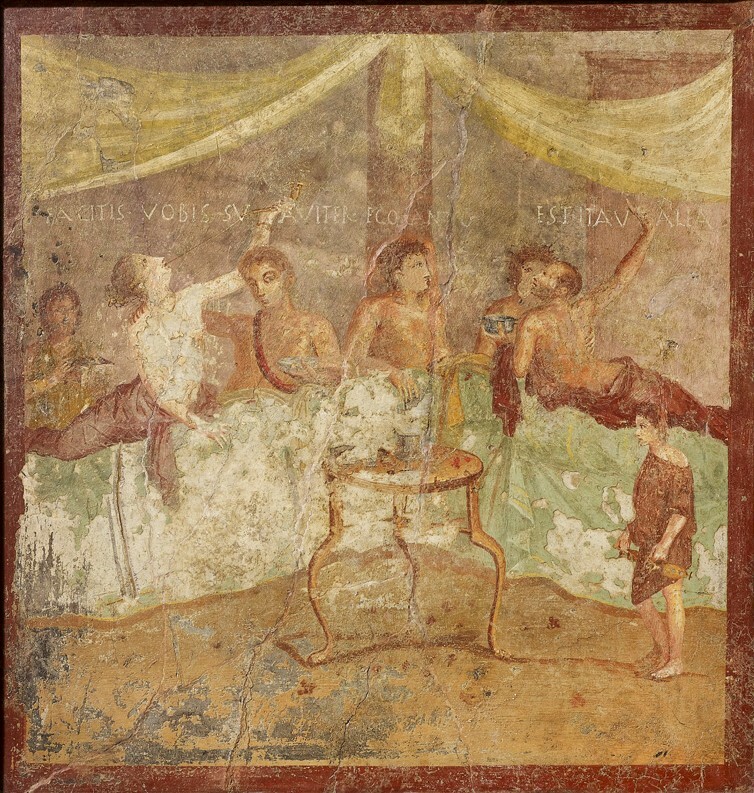 Image: A fresco showing a dinner party in full swing. Men and women recline together and one guest starts to sing!